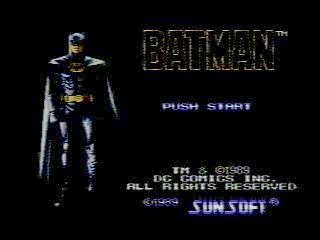 Released in 1989, Batman is one of those games that made gamers smash their controllers in frustration due to its difficulty. Loosely following the plot of the movie, Batman avenges his parents' death by hunting down the Joker. Loose was not an understatement, either: after the climactic fight atop a clock tower, Batman throws the Joker to his death. Best time: 0:10:19 by Daniel 'Dxtr' Eriksson on 2013-04-29. About the run, lets talk about the stuff that went wrong instead of everything that went good. Stage 3 - I think this was the "run killer" Lost maybe 1.5 seconds there. We know after months of runs, practicing, sweat and tears there are better strats but sooo much harder to pull off that it would take probably double/triple the attempts to get a good run going. I felt I hade to go for some "safer" strats, but not less impressive in anyway. So we will probably see sub 10:10 in the future. THAT is going to be wild! Badbrakes for several strats and cheering me on the twitch. Thank you! Sinister for pushing me to play this and racing me. Really gave me an opening in this game so I could learn it! And many others out there that contributed to this competition.